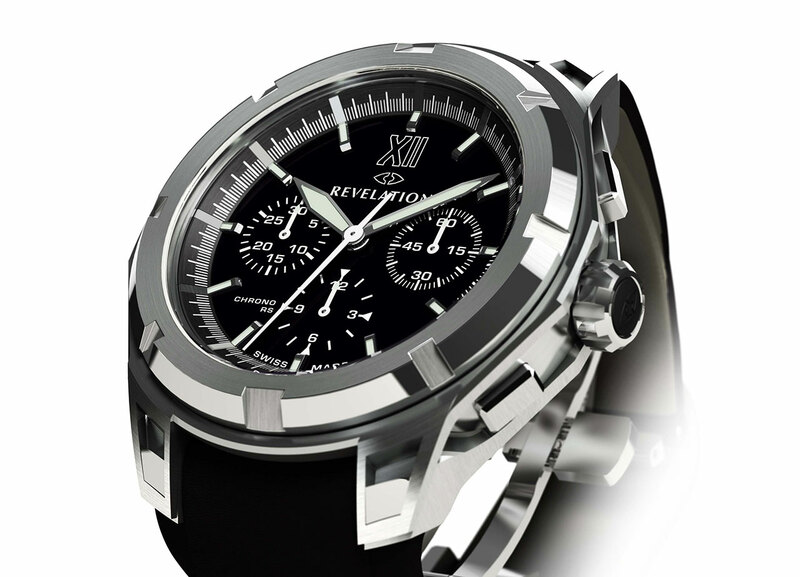 Thanks to its patented concept, unique in the world, the Revelation System®, the R03 CHRONOGRAPHE RS has two faces. 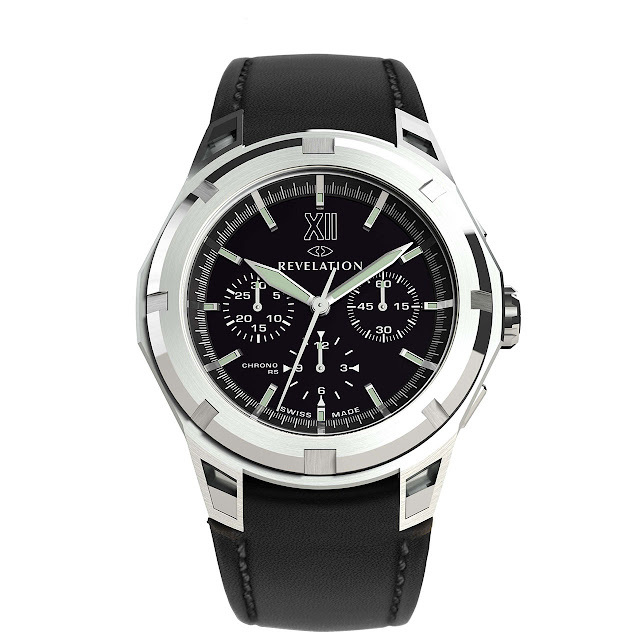 Its dial goes from transparent to black when the notched bezel is rotated ninety degrees. Derived from the extremely complex mechanism with a double differential coupled with an Archimedes screw of the historical piece R01 DOUBLE COMPLICATION, the “Revelation System®” of the R03 CHRONOGRAPHE RS has been modified and simplified to be placed inside the bezel of the watch. One of the polarizing discs is directly geared by the bezel. The rotation of the bezel is done manually, at will, by the wearer who decides which level of transparency he wishes for his dial, to admire the inside of the watch. The company Dubois Dépraz has developed the movement of the R03 CHRONOGRAPHE RS watch. This family business, founded in 1901 produces chronographs since more than a century. 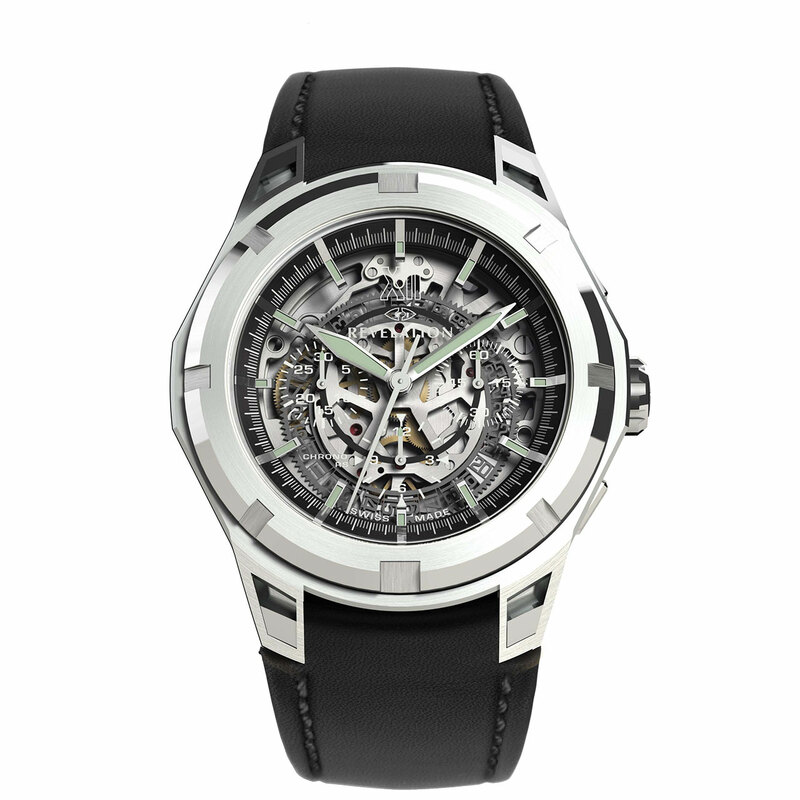 The two companies have worked hand in hand to personalize this automatic chronograph with skeletonized bridges. The heights of the hand-fitting have been engineered to integrate the “Revelation System®” to the movement. REVELATION has designed the date and the mass of this automatic caliber. The aesthetics of this specific mass reminds one of the tailor-made movement “Tourbillon Manège®”. It states its unequivocal affiliation to the brand identity. This is also the case of the bridges of the complication watch, which are designed with inner corners and finished by hand as well.